Over at Problogger.net, Darren Rowse has launched another group writing project. Darren’s last project had a "7 Habits" theme and I posted on habits of effective consultant bloggers. Darren’s latest topic covers developing goals. My readers probably aren’t very interested in blogging, but they may be interested in why I started Become a Consultant . By this time next year, I’d like to see 200 posts. That means I need to write something about “becoming a consultant” at least four times a week. 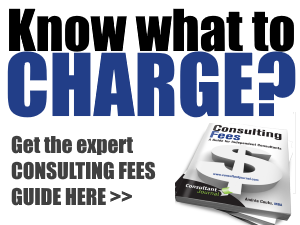 Most sites that discuss becoming a consultant just have one long article or perhaps a handful. I think there’s more to say. And that’s why I’m challenging myself to write 200 posts in one year. There seem to be few resources for people who want to become consultants, as opposed to entrepreneurs, home-based business owners, freelance writers and the like. When I became a consultant, I went through a entrepreneurship program, but I often felt my needs (and experiences) were in stark contrast to those in the program. I wasn’t selling widgets, renovating shop space, or looking for a cash register. But I did need to know how to set consulting fees, bill travel time, invoice, and find space for a home office in my (then) 400-square-foot apartment. Traditional advice for product-oriented businesses was little help for me and my service business. And, unlike “traditional” consultants, I wasn’t a grey-haired retiree looking to dabble. I felt a little lost in the world of entrepreneurship. Now that I’ve found my way, I’d like to help other consultants by providing a community resource where they can share their stories and read those of others. I’ve already posted on how I became a consultant. But, really, there’s a lot more to it. I started freelance writing in the early 90s and was making my living from consulting by the time of the Roaring 90s Tech Boom. And I’m still here, plugging away at it. I’ve got lots of stories to tell. 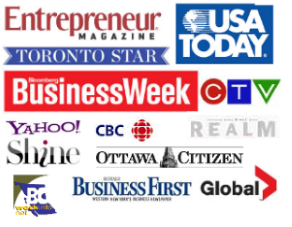 Even though I’ve been writing for the careers and education market since publishing my very first “big city” newspaper article, I’ve never really touched on my experience — not even on my consulting business site. So Become a Consultant Blog will eventually cover the things I’ve never been able to say. Forgive me for being vague here. I do envision this site becoming more than my consulting articles. I’d like to see it as an interactive community, as well as a marketing vehicle for consultants. 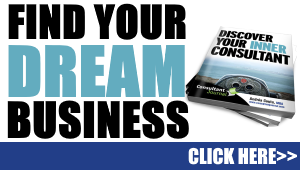 I’d like to help other consultants grow their businesses. In a year’s time, I expect this goal to be a reality – and for it to mean more than it does now. But I still need a little time for this one. My other goals probably sound a bit businessy. And that’s okay. 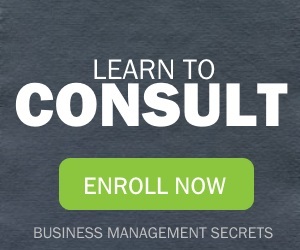 After all, I did become a business consultant, not a yoga guru or a camp counsellor. But, underneath all the layers of the “business” me, there’s a real person. And that person is a parent, partner, relative, friend and community member. The real me is more than a consultant, consumer, or taxpayer, despite what my various database profiles might have you believe. So I expect to see personal growth from my this endeavour – but I won’t be measuring it by revenues, links, traffic or the other stats over which I usually obsess. Instead, I want to look back and see what I’ve learned. I know I said I want to make this site an in-depth resource, a community, and a marketing vehicle. But I can’t exist in isolation. The very purpose of the World Wide Web (does anyone ever say that anymore?) is to weave a web of links. So, by this time next year, I hope to have made this blog part of the fabric of the web. To do that, I won’t always stick to the story of becoming a consultant and I won’t always write things that people like. But I will try to belong and help others find a place to belong. So those are my goals for Become a Consultant. Some of them may seem a little simple, but simple is good. Sometimes we focus on the Great Big Problems™ in life and forget that small successes lead to greater ones. Here’s hoping that Become a Consultant – and your own projects – lead to many small successes. "Why Become a Consultant?" from Become a Consultant Blog at ConsultantJournal.com.